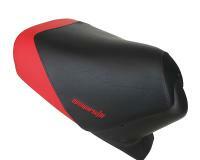 High quality scooter pillion seat cover from Opticparts DF made in Europe! An absolute must for all those who value the individual appearance of their scooters or for those who simply need a cost-effective replacement seat cover! This Roller Covers are made of high-quality and weather resistant imitation leather. 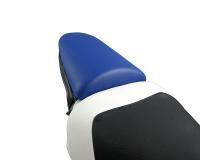 With Opticparts DF seat covers, you can match your colour perfectly. It comes without a pillion seat cover. The cover is shown stretched to emphasize the fit.